Zach Harper couldn’t stop puking. It was last spring, and Harper, who’s an NBA writer for FanRag Sports, was in the Bay Area covering the 2017 NBA Finals, prepping to do a podcast on the series. But, he found himself at the mercy of his stomach. He might’ve been hungover, he might’ve had food poisoning -- he wasn’t entirely sure. He’d had some vodka sodas the night before, and now he couldn’t keep down water and saltines. Wake up, throw up, pass out. That was Harper’s routine until about 2pm the next day when he remembered a possible solution to his misery: Pedialyte. His sister swore by it for hangovers, and a few months earlier in April, when he was in New Orleans covering the city’s pro basketball team, he’d joked about the seemingly absurd use of the popular children’s drink on his podcast, Talk Hoops, as a hangover aide. It was a Hail Mary attempt, but his best option at that point. So he called up Postmates to deliver him two bottles of Mixed Fruit Pedialyte. Harper and a growing number of adults are turning their nauseous, aching, hungover bodies towards the beloved kids’ drink, which is intended to help sick and/or dehydrated children replenish vital fluids and minerals that are lost, to make the morning after more bearable. Like most things in the internet era, it’s a lifestyle hack borne of grassroots, word-of-mouth energy on social media but also a big brand’s willingness to loosen up its formerly strict image. While its actual efficacy in stopping a hangover dead in its tracks is questionable, everyone from Coachella-going average Joe’s to celebrities are evangelizing the wonders of the electrolyte-fueled beverage, helping usher the brand and its parent company, Abbott Laboratories, into the adult market. "All of a sudden, I felt like a human again." The brand’s sales have reflected this newfound use. 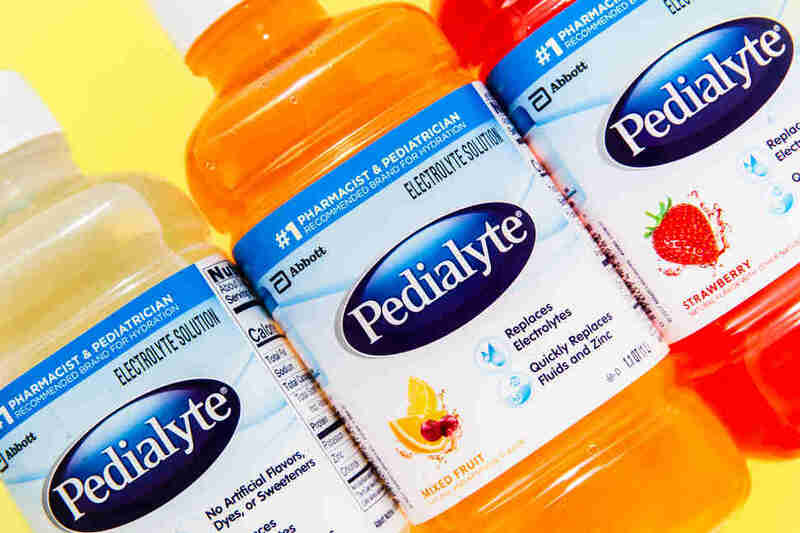 From 2012 to 2015, Nielsen Homescan found that Pedialyte’s sales grew 22% to $102 million. This growth finally forced Abbott’s hand to push towards marketing to grown-ups in 2015. 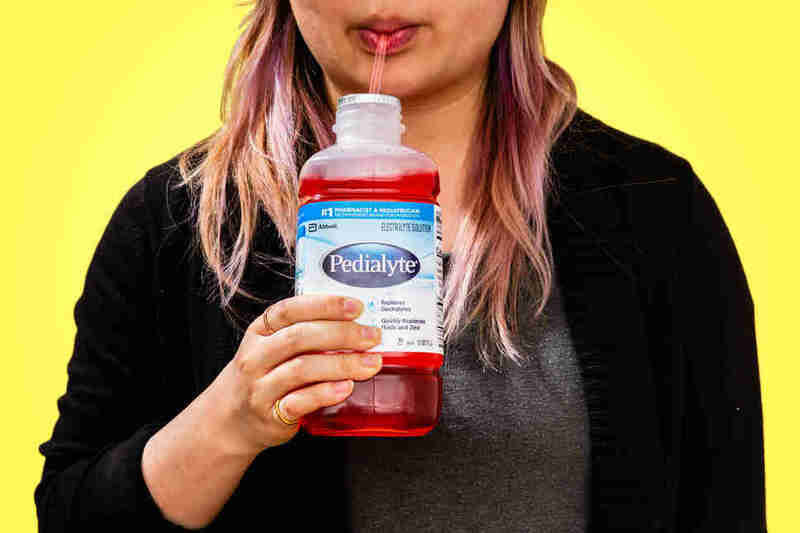 “Today, almost half of our Pedialyte business [is households without kids],” Frank says in an email. 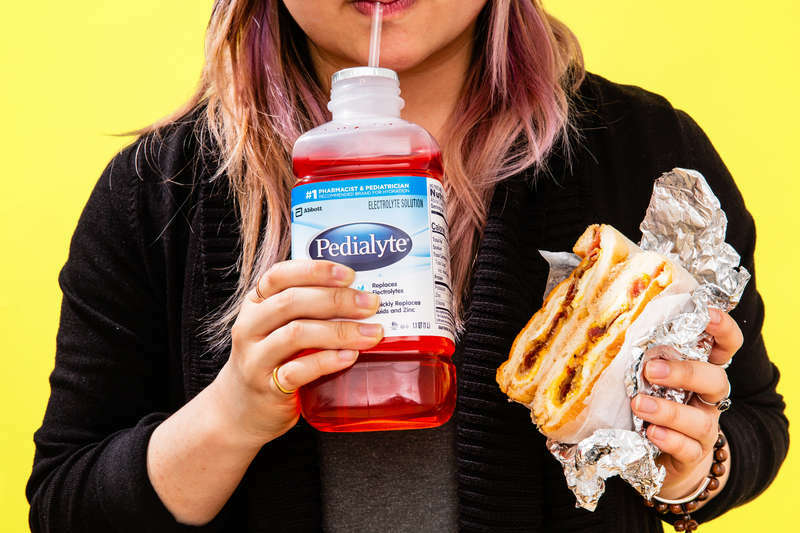 Over the past year alone, Google searches for “Pedialyte and hangovers” surged 3,600%. Of course, with any “It” thing, there’s a celebrity element. Several years ago both Pharrell Williams and Miley Cyrus were purported to be converts, and quickly scrolling Twitter yields handfuls of verified career partiers touting Pedialyte’s re-hydrating prowess. People like Michael Kelly of House of Cards fame and musicians like Travis Barker have weighed in. In Harper’s case, his prodigious Twitter and online presence allows him to evangelize about Pedialyte’s powers to a wide audience. Fans will tweet at his podcast and explain that they, too, subscribe to Pedialyte the morning after drinking, and Harper’s frequent mentions of the brand on the platform have even resulted in a particularly special gift of next-level Pedialyte from the company (although, Harper’s reluctant to say that he was sent it specifically because of his online following). “They sent me this ‘Pedialyte Black Label’-esque box,” he says. “There were lights in it, and it contained green and light-blue bottles, a shirt that said ‘Socialyte,’ and, like, because your head’s supposed to still hurt, a pair of sunglasses." 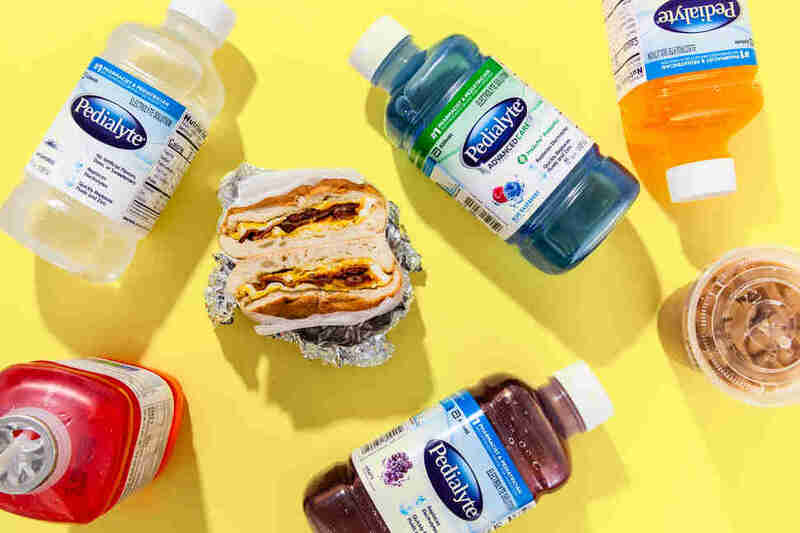 Business Insider retail reporter Kate Taylor says Pedialyte’s bifurcated audience is extremely unique, and while Gatorade or Powerade might be its closest competition, its marketing is probably more closely related to shoot-from-the-hip food brands like Wendy’s or Denny’s. Case in point: Taylor’s first run-in with Pedialyte as a drink for adults came at a New York City bar where she found a bucket filled with coupons for the drink (and Pedialyte's name misspelled, natch). So what’s next? 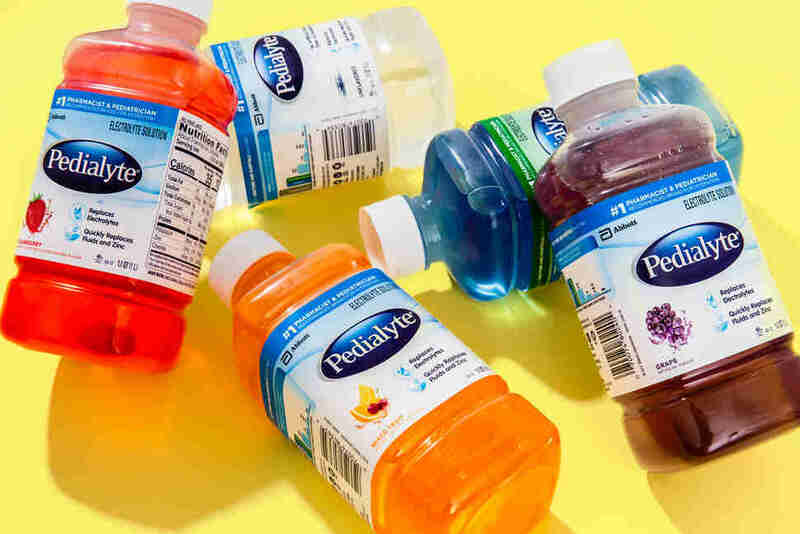 According to Abbott, the brand will continue to expand into the adult market, focusing its energy on everywhere “from pharmacies to music festivals.” Pedialyte seems to have ditched the cold feet it might’ve had in pivoting its brand from just focusing on pediatric needs to humans of all ages who need "rehydration." Who knows, maybe next year it'll even be an official sponsor of Coachella.